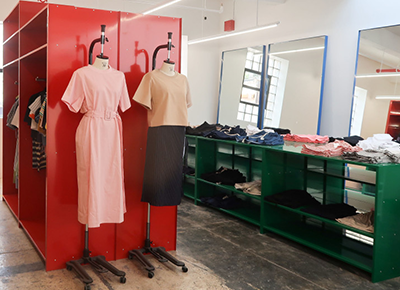 NEXT ARTICLESouth Korea's Favorite Fast-Fashion Brand Just Opened a Shop in the U.S.
It’s been more than two months, but Amal Clooney still has the royal wedding on her mind. On Saturday, Clooney stepped out for a date night with her husband, George, British designer Stella McCartney (who was responsible for Meghan Markle’s divine wedding reception gown) and McCartney’s husband, Alasdhair Willis, in Lake Como, Italy. But her double date crew wasn’t the only royal connection of the evening: Clooney also donned a citrusy shade similar to the McCartney-designed marigold dress she wore to Prince Harry and Meghan Markle’s nuptials. The high-powered human rights attorney topped her bright orange shorts (similar $158) with a one-shouldered printed Monse top from the 2019 resort collection (price upon request), pink block-heel sandals (similar $84) and George Clooney, aka the best accessory to any outfit.